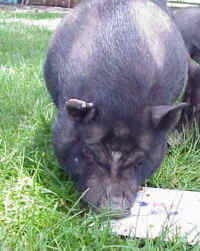 23 August 2003: Clarabelle's story started out like many.. a phone call from someone who "loved" their pig but was moving to a subdivision where they couldn't take her. (Around here that's pretty unlikely.. we allow about everything in the yard here except perhaps full grown Rhinos) So the true story was probably that they had tired of Clarabelle. Christina and I went to pick her up one day in April and found her in a pen with a tree down across it so she could go out into the woods and escape. A second effort was required, with a temporary pen being built to catch her in. Once home to the sanctuary she was found to be exceedingly head shy, as though she had been often hit. I typically toss handfuls of "seek and eat" treats like nuts or cookies and the yard pigs always come running to grab them but not Clarabelle. She would run away as though I was throwing stones. But as time went on her delightful natural personality emerged. A very funny and talkative girl was Miss Clarabelle! Her ear was badly mangled and her nose deformed from a time in her youth when she was attacked by the family's dog.. but when she "giggles", (I swear that's what it is) she is just a delight. Clarabelle is only three and too fat and would have been slimmed down before spaying but when she developed some "female" problems a few weeks ago I got her in for spaying right away. The beginning of her nightmare...One problem ahs been solved only to find another and yet another.. and today she is recuperating (we hope completely) from her latest surgery. For the past two weekends I and the vet staff at our clinic have labored to keep this girl alive. 2 emergency surgeries followed the original spay surgery, both on weekends.. I thank my lucky stars I can count on my vet clinic to answer the emergency call in under 3 minutes and meet me with a full staff as fast as I can get there.. day or night...every time.. and I have certainly "tested" them lately! You don't even want to know what the vet bill is.. nor do I..
To the left is a picture of Clarabelle painting Pigassos which we hope she can do again soon. 6 September 2003: Yesterday Clarabelle was given a clean bill of health! She is now unrestricted on any pig activity and can roll around in her piggy pool or run to grab a falling pear and even spar with Pauley for a bed they both want.